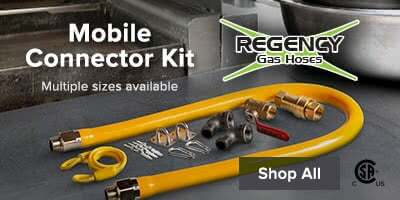 Regency 48" Mobile Gas Connector Hose Kit with 2 Elbows, Full Port Valve, Restraining Device, and Quick Disconnect - 3/4"
Capacity per Fry Pot 20 - 50 lb. Meet the frying needs of different food items without having multiple fryers with this Dean SM5020G liquid propane split pot 50/20 lb. floor fryer! This fryer offers two separate frying pots: a 50 lb. pot with 4 tubes and a frying area of 14" x 14" x 3 1/2", and a 20 lb. pot with 2 tubes and a frying area of 6 3/4" x 14" x 3 7/8". With a combined heating capability of 170,000 BTU/hour, you can cook different menu items at the same time, in the same space-efficient fryer, without worrying about flavor crossover. Exclusive Thermo-tube heat exchange tubes have durable stainless steel heat diffusing baffles to transfer heat energy as efficiently as possible. The durable thermostat probe ensures accurate temperatures for heating, cooking, and recovery, and the millivolt controller doesn't even need an electrical hookup to work! This unit is easy to clean with its 1" and 1 1/4" drain valves. The extra wide cold zone traps sediment away from the cooking area for disposal, and the positive-sloped bottom helps to quickly drain oil and sediment. 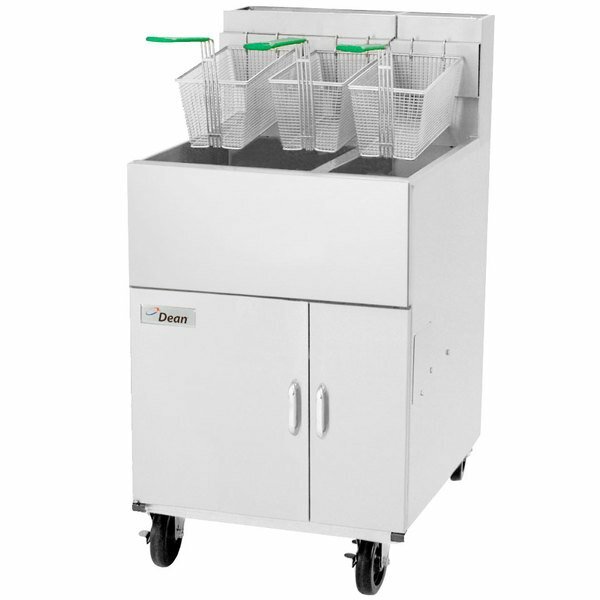 This fryer has two gas connections, one for each pot, and includes three 5 7/8" x 12 5/8" x 6 5/8" fry baskets and basket hangers for your convenience. Left to Right: 23 1/3"
Front to Back: 29 1/4"
This item meets the standards imposed by the Canadian Standards Association (CSA) for use in the United States of America and Canada. This item has been certified by the Canadian Standards Association (CSA) and meets applicable U.S. standards. This unit comes with a 3/4" gas connection.